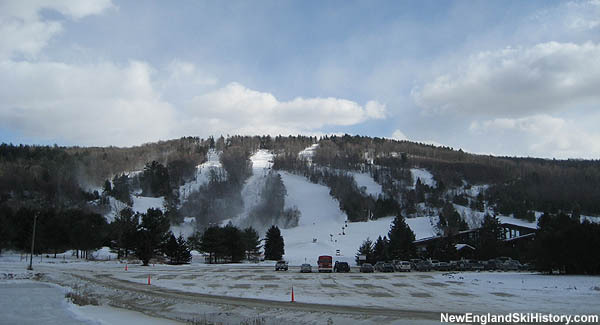 Located in the northwestern part of the state, Mohawk Mountain has been the cornerstone of the Connecticut ski industry for over half a century. Downhill skiing on Mohawk Mountain may date back to 1937 or 1939, when the Connecticut Winter Sports Association reportedly cut an alpine ski trail in cooperation with the State Forest Department. It is not known if the trail was maintained during World War II, but some press accounts suggest it may have been in a state of disuse by the middle of the 1940s. 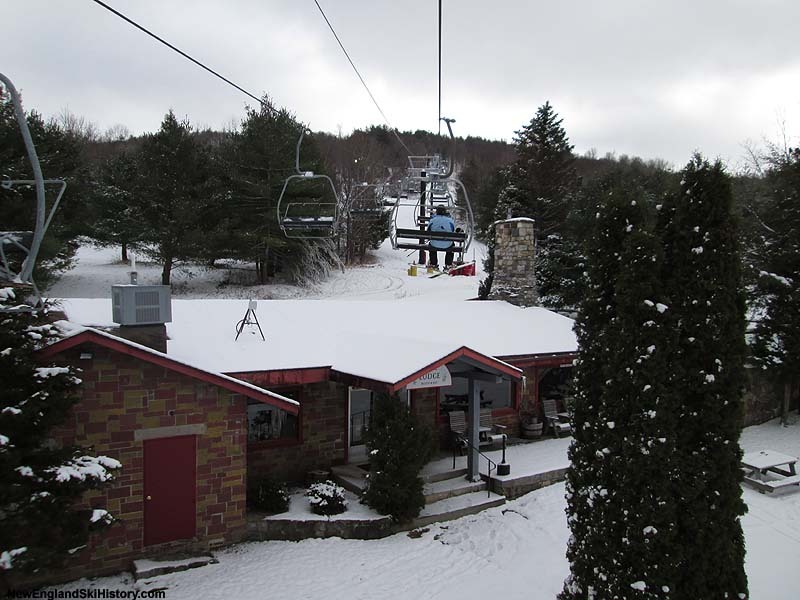 Lift served ski development at Mohawk Mountain dates back to February of 1947, when Walt Schoenknecht, his wife, and father started developing a ski area around the Mohawk ski trail on land leased from the state. Initially a $45,000 investment, Mohawk was instantly one of the larger ski areas in New England when it opened in 1947-48, featuring three slopes and a half dozen trails of all abilities, spanning some 600 vertical feet. Six rope tows operated weekends, holidays, and some midweek afternoons. Walt's wife Peg, a former Army nurse, set up the first aid clinic. While the ski area was initially successful, a snow drought in the winter of 1949-50 brought operations to a halt. Ever the creative thinker, Walt brought in countless truckloads of ice and used a massive chipper to create a snow surface, which allowed the area to open on one slope, served by multiple rope tows. At the same time, he was also taking part in preliminary experiments compressed air snowmaking. Further work was done in the fall of 1950 with Larchmont Engineering equipment at Mohawk. By the time the 1950-51 season rolled around, the new snowmaking system was advertised regionally. By this point, the area featured nine rope tows. A couple of years later, Walt set his sights on developing a mega ski area on Mount Snow. In 1958, preparations began for a future chairlift installation at Mohawk. 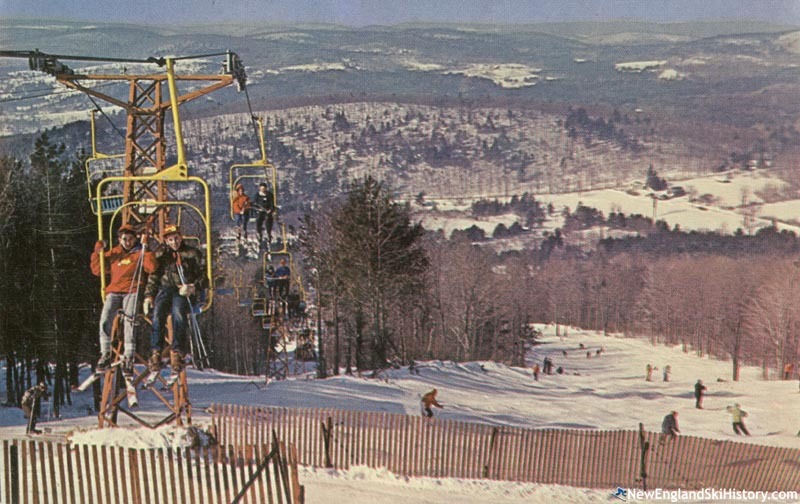 Connecticut's first chairlift was installed at Mohawk for the 1960-61 season, as well as expanded snowmaking. Future Butternut developer Channing Murdock took over day to day operations of Mohawk. Two more chairlifts were installed by the end of the decade, cementing Mohawk's status as the largest ski area in the state. 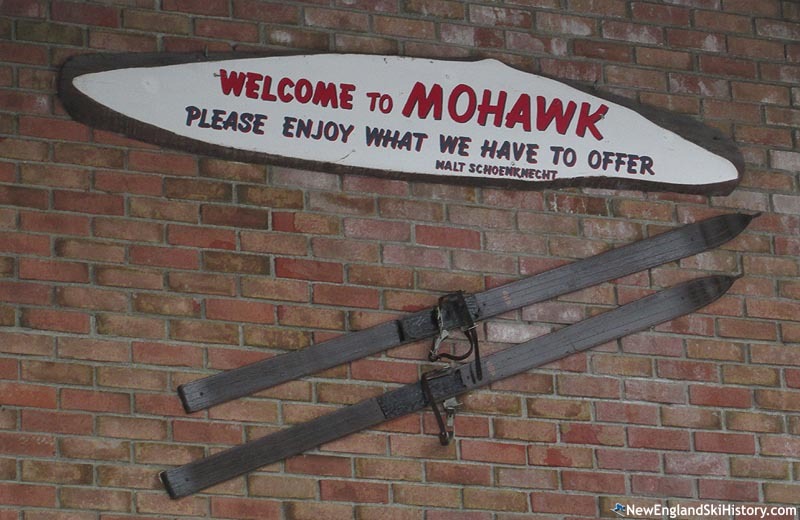 After losing ownership control of Mount Snow, Walt's focus returned to Mohawk in the early to mid 1970s. Later that decade, Mohawk installed its first triple chairlift, the Boulder Triple. The 1980s brought sadness to Mohawk, starting in the early part of the decade when Walt began to fight cancer. His daughter Carol Lugar returned to the area she grew up at and helped him manage it. Walt passed away prior to the start of the 1987-88 season. As the clocks at the mountain struck 4:37 on the afternoon of July 10, 1989, an F4 tornado ripped through Mohawk, leaving $1.5 to $2 million in damage. Pieces of the ski area were later found scattered miles away. Initial industry analysis was that the ski area would not be able to open for at least a year, if ever. However, with the help of ski areas across the country, Mohawk was able to rebuild in time to open for the 1989-90 season. Nonetheless, the financial impact would affect Mohawk for years. Despite being located near a large population base, Mohawk Mountain operated as a day-only ski area for decades, in part due to the desire to avoid an alcohol fueled party atmosphere that plagued other ski areas at the time. Feeling confident that it could avoid that in an era that was "more socially conscious," Mohawk added night skiing for the 1991-92 season, in part to help pay off tornado related debt. Alcohol remained banned, as Lugar told Skiing magazine, "We don't feel that drinking mixes with skiing any more than it mixes with driving. My child has to ride these lifts." A major lift infrastructure initiative took place starting in the 2000s, resulting in the installation of four triple chairlifts. Mohawk's last double chairlift, the Arrow Head Double, was replaced in 2013 with the Arrowhead Triple. With growing demand for more base facilities, Mohawk constructed major lodge expansion in 2015 which doubled seating capacity. "I found Mohawk around 10 years ago. It's a fantastic place. The people who work there are the friendliest in the industry. As for the mountain, the terrain is fun and the snow is always great. I've never had a bad day there, and can't wait to get back. " "I was 17 and a member of the New Haven ski club and repeatedly skied Mohawk. In early 1954, at a club meeting, I remember Walt Schoenknecht saying "I have found a mountain in Vermont the gets a foot of snow when all the surrounding mountains don't get any and I am going to build a ski area there and call it 'Mt. Snow". 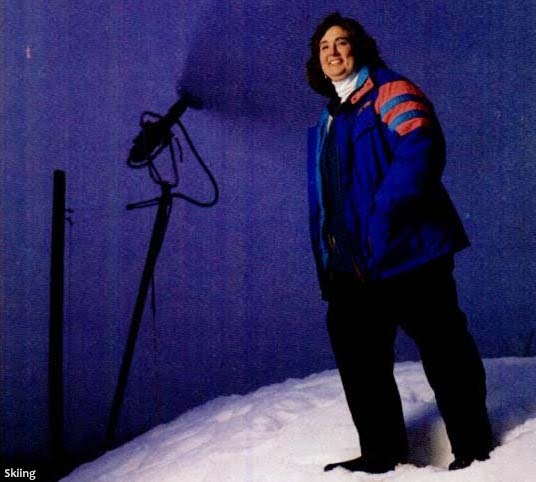 He hired another member, Andy Andrews, to help him, and sure enough, they made Mt.Snow happen - much to my skeptical teenage mind at the time. I went south to college at Duke that year, and then, eventually out west and the Calif. sierras. I never skied Mohawk again or Mt.Snow, but I do remember reading about amazing growth of the resort and the dearth of snow in New England for so many winters. That was actual "climate change". " "My second day of skiing was here in 1971. Age 8. I remember wood skis, leather boots and safety straps. I wore jeans over long johns and remember being soaked to the bone at the end of the day, the result of falling dozens of times on the beginner are"
"I started working at Mohawk the first year it opened. I was 14 and madeSandwiches and helped in the kitchen. I worked there all through highSchool to get spending money. I loved it. "